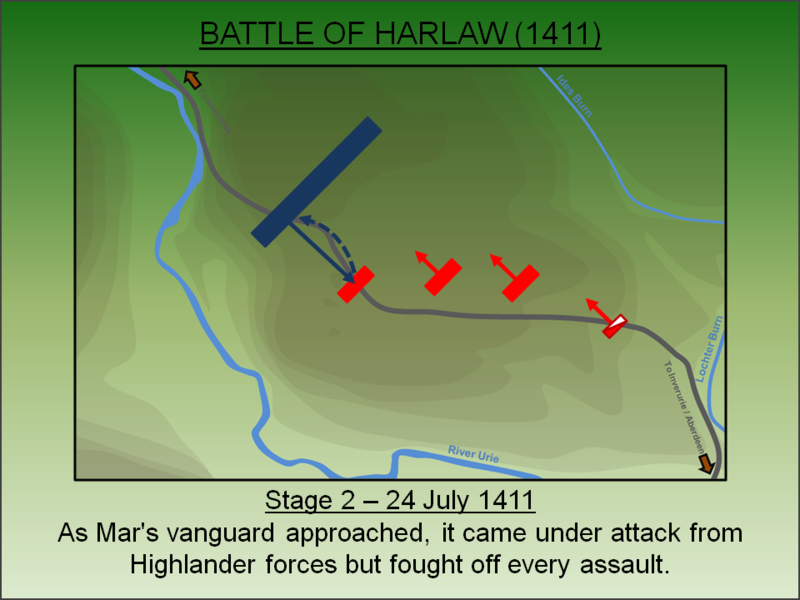 The Battle of Harlaw (1411) was fought between English backed Highlander forces under Donald of Islay, Lord of the Isles and a Lowland army led by Alexander Stewart, Earl of Mar. The bloody clash saved Aberdeen from being sacked and checked the expansionist policies of the Lords of the Isles. The start of the fifteenth century saw a period of increased tension between England and Scotland. In 1399 Henry IV of England had deposed and murdered his predecessor, Richard II, prompting condemnation from Robert III of Scotland. The Scottish King refused to accept Henry as King - he referred to him as the 'Duke of Lancaster' - and gave his approval for a major Scottish raid into northern England in June 1402. 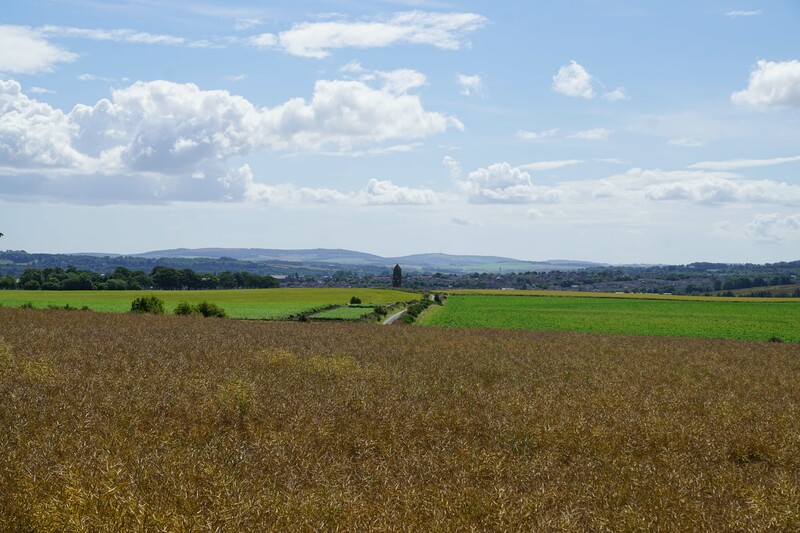 Although this was defeated at the Battle of Homildon Hill (1402), it set in motion a series of events that culminated in the Percy rebellion against Henry IV. Furthermore, the English King was preoccupied with a major Welsh rebellion, led by Owain Glyndŵr, that was consuming Royal resources. 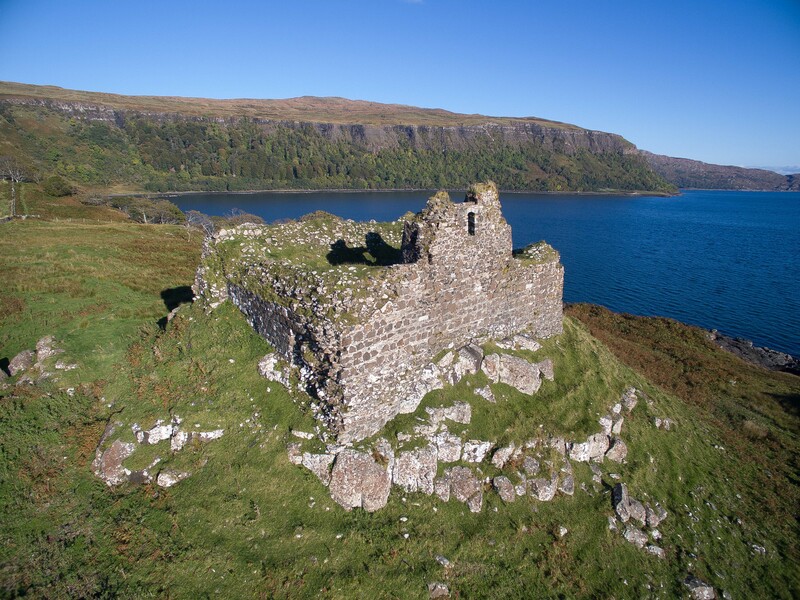 He could not afford concurrent warfare with Scotland and therefore forged an alliance with Donald of Islay, Lord of the Isles in the hope this would distract the Scottish King and prevent further attacks on England. The English hand was also strengthened in March 1406 when Robert III's son and heir, Prince James, was captured at sea by English forces. He was held as a hostage (for the next 18 years) as insurance against any further Scottish attacks. Robert III died in April 1406 and the Scottish throne passed to his incarcerated son, now James I. In his absence the King's uncle - Robert Stewart, Duke of Albany - secured the role of Regent and took control of the Royal estates. Fearing this would stabilise the Scottish regime and give them capacity to cause trouble south of the border, the English renewed their alliance with Donald of Islay who seized the opportunity to lay claim on the Earldom of Ross. The Earldom of Ross encompassed vast tracts of land in northern Scotland. In 1402 the then Earl, Alexander Leslie, died leaving a young daughter named Euphemia as his heir. Robert Stewart, Duke of Albany secured wardship of Euphemia and her estates. Euphemia was then incarcerated within a nunnery and was encouraged or compelled to sign the Earldom over to the Duke's son, Alexander Stewart, Earl of Buchan. However, Donald of Islay also had a claim through his marriage to Euphemia's aunt, Mariota Leslie. Following his renewed alliance with the English, Donald commenced raising forces to press his claim. The scene was now set for a battle between the two factions. It took Donald of Islay some time to raise his forces meaning he did not go on the offensive until Spring 1411. He mustered his forces at Ardtornish Castle and advanced along the Great Glen culminating in an attack on Inverness during which the town was sacked. As Albany still refused to recognise his claim to the Earldom of Ross, Donald then headed south-east towards Aberdeen intent on reeking destruction upon that urban centre. However, the Highlander approach was slow and this afforded the Stewarts time to prepare. The Duke of Albany's nephew - Alexander Stewart, Earl of Mar - was the regional commander and raised a force to counter the Highlanders. In particular the populace of Aberdeen, keen to ensure their town didn't suffer the same fate as Inverness, rallied to his support under the Provost, Robert Davidson. When Stewart's scouts informed him that Donald was approaching from the west, he marched out to engage. He camped his forces at Inverurie on 23 July 1411. The Highlander force was under the command of Donald MacDonald (of Islay), Lord of the Isles. He had a large force, some accounts suggest perhaps 10,000 strong, drawn from a variety of West coast clans including Chattan, Cameron of Lochaber, the MacKintoshes and the MacLeans. Very few of these men would have had any form of armour. 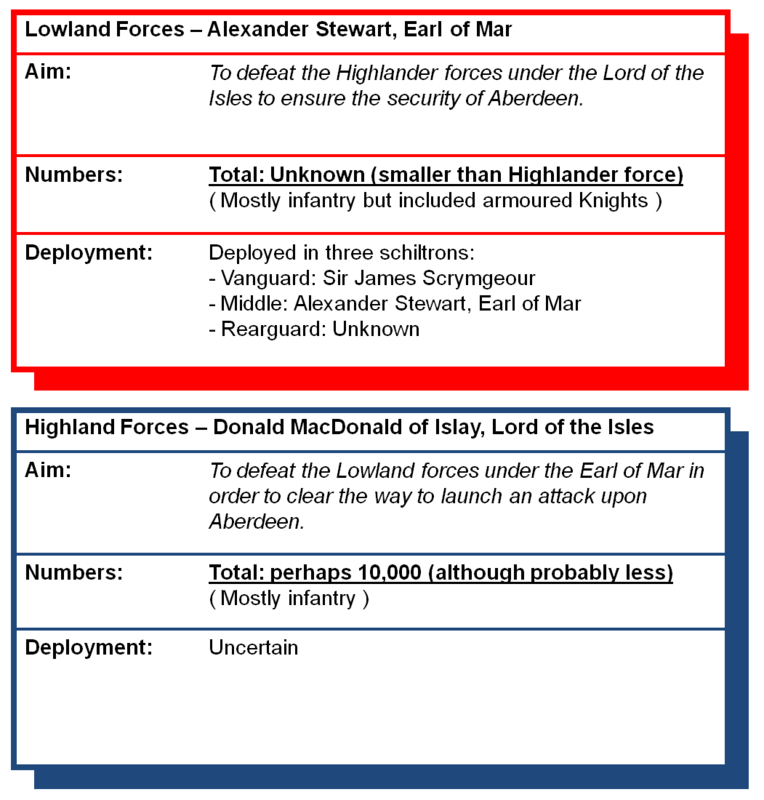 The Lowland force was under Alexander Stewart, Earl of Mar. He had raised a sizeable force, albeit significantly smaller than his opponents, from across Aberdeenshire. His army also included a number of lowland Knights drawn from prominent lowland families including Leslie, Lovell, Murray and Straiton. These men and their entourages, although relatively few in number, were well equipped and heavily armoured. The battle was fought on the morning of 24 July 1411 on open moorland straddling the medieval road between Inverness and Aberdeen. Mar configured his forces into the three schiltrons, tightly packed formations of infantry and spearmen. He held his cavalry in reserve. He advanced north-west from Inverurie towards the high ground at Harlaw where the Highlanders were camped. The Highlanders, who probably held the fighting qualities of their opponents in low regard, launched repeated attacks against the Lowland lines. The initial assaults were probably made against the vanguard, under Sir James Scrymgeour, but were beaten off by his well armoured men. As the main and rearguards arrived on the summit, they too were attacked by the Highlanders. 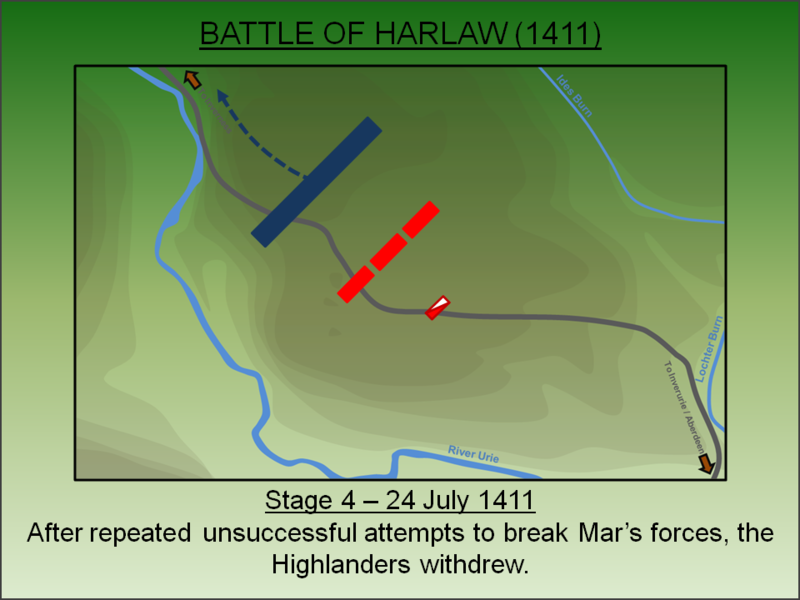 Mar adopted a static defensive position and, although his forces came close to breaking, the Lowlanders held their positions. The Highlanders, who were predominantly unarmoured, suffered appalling casualties. As dusk approached, having failed to breach the Lowlander lines, the Highlanders withdrew. They had suffered extensive casualties, some accounts suggest as many as 1,000 dead, and crucially this included the clan chiefs of the MacCleans and MacKintoshes whose loss caused many of the clans to lose the will to fight. Under the cover of darkness, Donald led his men off the field and marched his men back to the West Coast giving up his attempts to sack Aberdeen. The Lowlanders had suffered around 600 casualties. In the immediate aftermath of the battle both sides claimed victory but in reality it had been a bloody and costly engagement for both sides. Nevertheless, Alexander Stewart's actions had saved Aberdeen and checked Donald of Islay's attempts to expand his influence eastwards. Alexander later went on to defeat Donald of Islay's son, also called Alexander, at the Battle of Lochaber (1429). However, two years later Alexander Stewart was defeated at the Battle of Inverlochy (1431). Barrett, C.R.B (1896). Battles and Battlefields in England. London. Guest, K (1996). British battles: the front lines of history in colour. Harper Collins, London. Henderson, C.S (1948). 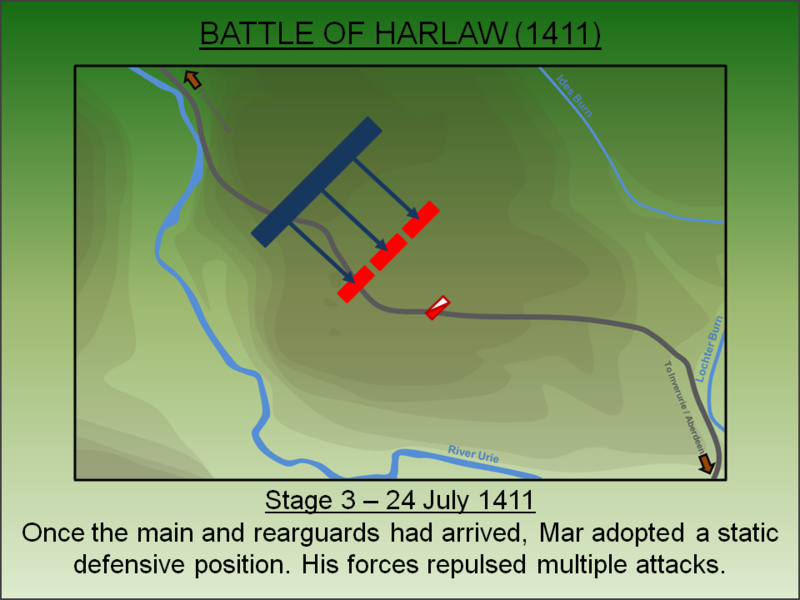 A Note on the Battle of Harlaw. Lancaster, J.H.D (2017). Harlaw: Battlefield visit notes and observations. CastlesFortsBattles.co.uk. Marren, P (1990). 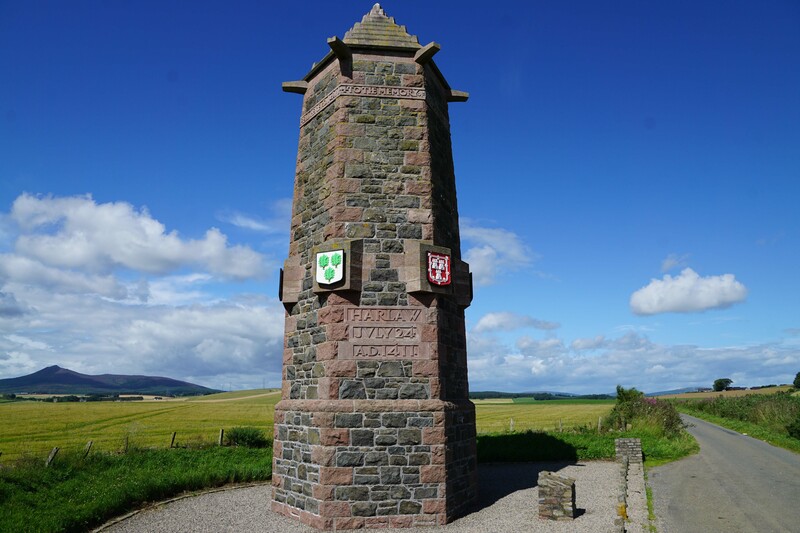 Grampian battlefields: the historic battles of North East Scotland from AD84 to 1745. Aberdeen University Press, Aberdeen. McDonald, A (2001). Battles and Ballads of Scotland. Olson, I.A (2014). Bludie Harlaw: Realities, Myths, Ballads. John Donald Short Run Press. Ordnance Survey (2015). 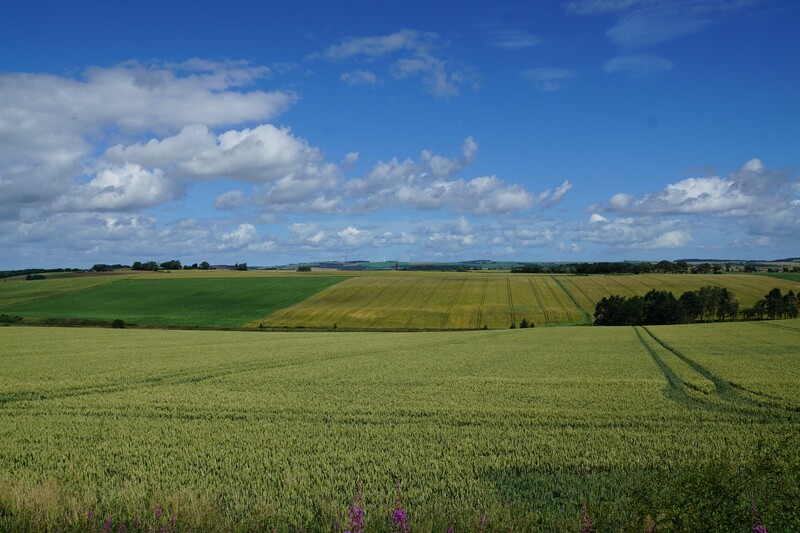 Aberdeenshire, Inverurie. 1:1250. Southampton: Ordnance Survey. Prestwich, M (1996). Armies and Warfare in the Middle Ages: The English Experience. Yale. Roberts, J.L (1999). Feuds, Forays and Rebellions: History of the Highland Clans 1475-1625. Edinburgh University Press, Edinburgh. Simpson, W.D (1949). The Earldom of Mar. Aberdeen University Press, Aberdeen. Williams, R (1984). The Lords of the Isles: the Clan Donald and the early kingdom of the Scots. Hogarth Press, London. The battlefield has changed significantly from the time of the battle. Originally open moorland, it is now arable fields. Nevertheless the site is undeveloped allowing the visitor to appreciate the topography. A (very large) battlefield monument stands near where the centre of the fighting probably took place. 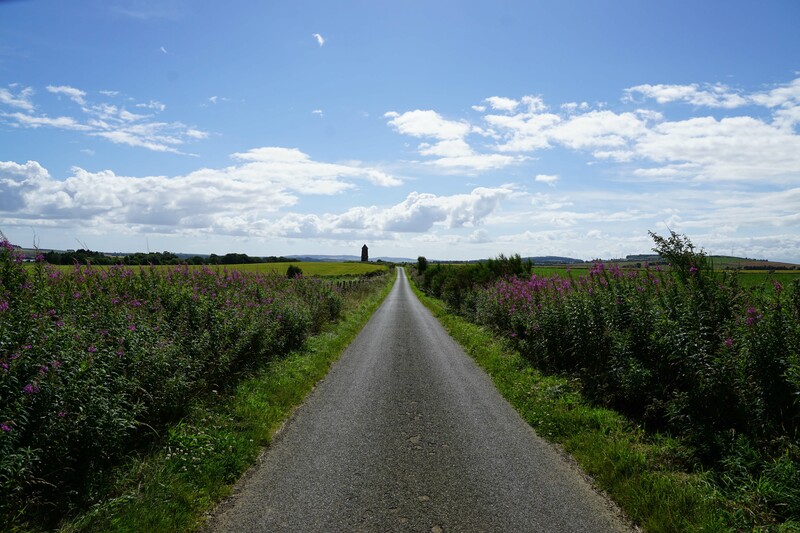 The road on which the monument stands might be the line of the medieval Inverness to Aberdeen road. High Ground. 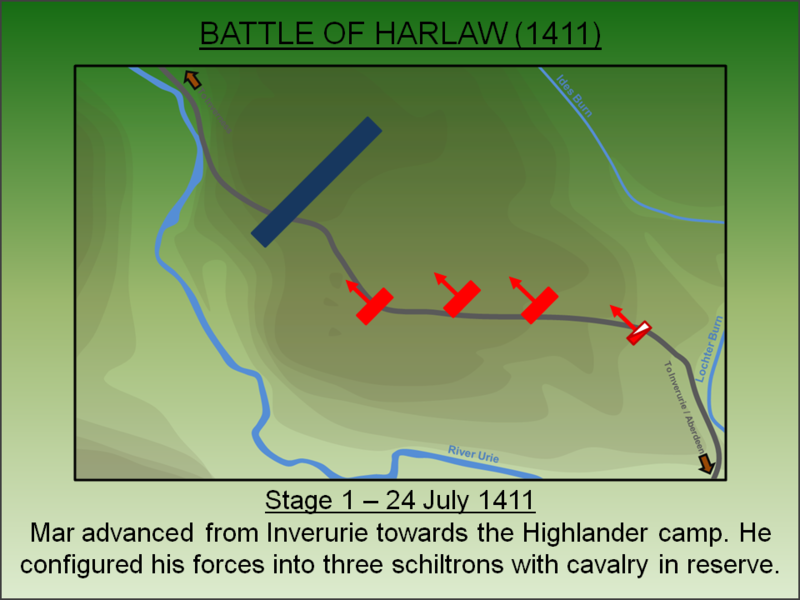 The battle was fought on and around the high ground of Harlaw, several miles from Inverurie. The centre of the fighting is believed to have been around the site of the monument (just visible in the centre of the picture above). Monument. The substantial monument was designed by the architect William Kelly and erected in 1911. The inscription around the top reads "To the memory of Provost Robert Davidson and the Burgesses of Aberdeen who fell here, AD 1411". Inverness to Aberdeen. The battle was fought straddling the Inverness to Aberdeen road. In the medieval era it is believed this followed the line of the unnamed road on which the monument is now found. View West. The Highlanders had camped overnight around the area now occupied by the monument. View East. View of the starting position of the Lowlanders. Ardtornish Castle. Donald of Islay initially mustered his forces at Ardtornish Castle on the West Coast before moving along the Great Glen, sacking Inverness and advancing to Harlaw. River Urie. The river is located just to the south and west of the battlefield. 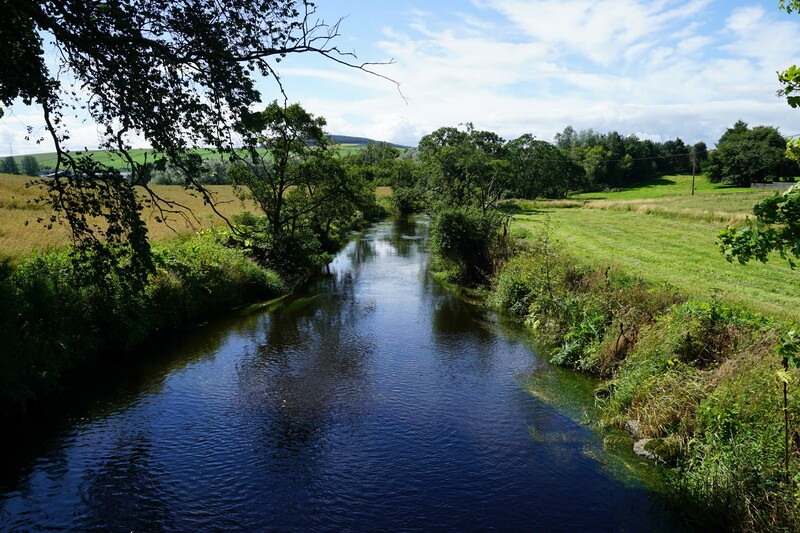 The Highlanders were following the Aberdeen road to a crossing point over this river at Inverurie. The monument (and centre of the battlefield) is found on an unnamed road off the B9001. The turning is sign-posted. On-road car parking is possible at the monument.